Charlie Carveles at Royale Oceanic is offering Oceanco’s 82m motor yacht Alfa Nero for charter from June 5th to July 25th in the Western Mediterranean. Alfa Nero was built by in 2007 to a design by Oceanco and Nuvolari Lenard. This impressive superyacht has some incredible design features such as an immense aft-deck area featuring a large infinity pool (7m x 3.5m) that can be converted to a helipad or dance floor. Following a refit, she now has a sauna on the pool deck. Alfa Nero features over 4,000 sq. ft. of living space and has accommodation for 12 guests and 28 crew members. She boasts three separate dining areas, a leather stepped staircase, glass-enclosed elevator, a grand piano, dance floor, gym, theatre lounge and beauty salon. She has just had a full hull and superstructure repaint and new A/V systems throughout. 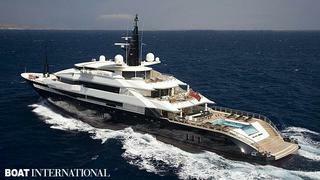 Alfa Nero was featured in Volume 21 of The Superyachts annual and weekly charter rates start at €840,000.